Trees decorated with light strings look festive for the holidays—or anytime of the year if lighting up a backyard or outdoor room. Identify a tree in your yard that has an interesting form and elegant branches that would look especially striking when illuminated. Outdoor and holiday designers and decorators have seen the light and they aren't returning to the dark side anytime soon. One is not enough—soon every trunk, branch, and limb that resembles a tree gets wrapped and lighted. 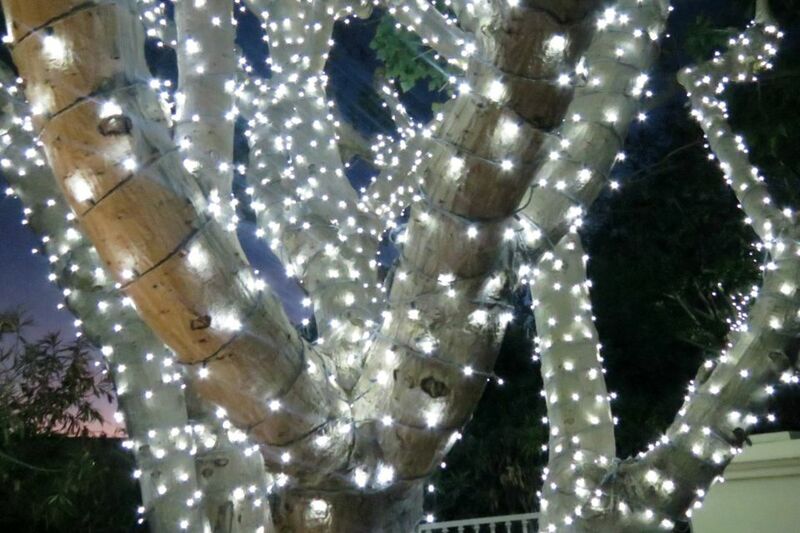 Bare, leafless trees—known as deciduous—are the best types to be wrapped with lights. At night, their trunks and branches become magical, especially horizontal-spreading varieties. Palm tree trunks wrapped with white or red lights show off their vertical, upright forms at night and draw the eye upward toward the clear night sky. Intrigued? Discover the right way to light up your trees. Size is obvious here. If you have a big tree in your yard that's the centerpiece of the landscape, light it up! Shape: Stand back and survey your front (or back) landscape. Which tree(s) have the most interesting shapes, especially during the holidays? An umbrella-shaped tree or one that has horizontal-spreading branches is more noticeable when illuminated. Strength: Don't be so quick to wrap or cover a new or fragile tree with lights, just because the tree is there, in your yard. Find another specimen to adorn with lights and let the young sap become a mighty oak. Budget and number of lights and strands: You know that old saying, "A little goes a long way?" That does not apply when wrapping a tree in lights. Think about it: depending on the circumference of the trunk, each time you wrap those lights 'round and 'round, there goes another 20, 30-or so twinkling lights. A tree that is wrapped with light strands one-third the way up its trunk is not going to look festive or complete. Plan and budget accordingly. Start small and add more lights each year. Ready to wrap your trees and dazzle the neighborhood? Gloves: Leather, suede or synthetic, or maybe a couple pairs for different areas of the tree. If you choose to not to wear gloves, prepare for a few cuts and scrapes on those lovely, manicured hands and fingers. Light strands, preferably LEDs (light-emitting diodes). Why? We have 10 good reasons why you should switch to LEDs. * To avoid having to plug-in several strands of lights, opt for one of those large spools or reels of lights to make the job easier. The initial price may seem high, but it's worth it if you plan on using them year after year. In addition to the color of the lights themselves, think about the color of the electrical chord. White is fine (it's what we used here), but brown or green might be preferable, depending on the color of your tree's trunk and branches. Speaking of light color, warm white LEDs provide a nice, warm glow reminiscent of the incandescents that everyone loves and many diehards with which so many diehards and traditionalists have trouble parting. Cool white offers a bluish glow and colored lights are either multicolored or one color. If using several strands of white lights, make sure you are consistent and buy or choose all warm or all cool white lights, unless you're going for a warm/cool effect. One color looks probably looks better. A staple gun or nail-hooks are optional but not advisable--they can damage the tree trunk. Rugged bark is sufficient to "grab" on to light strands. *Caution: Don't mix incandescent (regular, old-school, non-LEDs, what you already have) with LEDs. Before stringing the lights end-to-end and wrapping, test each strand by plugging into an outlet to make sure they work. Start by attaching the light strand to an outdoor (weatherproof) extension cord and begin wrapping at the base of the trunk. Decide where the visible base of the tree is, and start from there. Visible base? Sure, the tree's trunk grows from the ground on up—but if you can't see the bottom of the trunk from the street, why waste several feet of lights on it? Shrubs, tall grasses, rocks and other landscaping elements might cover or obscure the very bottom of the trunk. Walk to the curb or out to the street—carefully, watching for cars—and make a mental note as to where the trunk is visible, and take it from there. 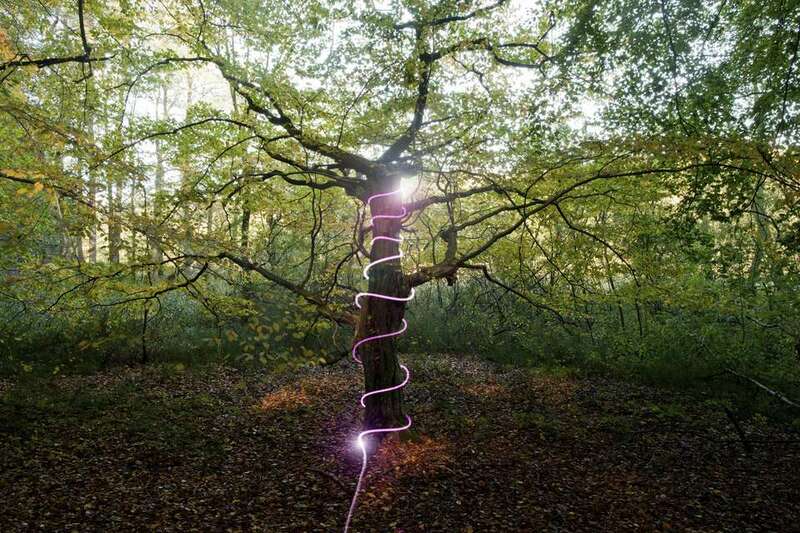 Taking the ball or bundle of light strands, start wrapping around the tree trunk, moving upward as you go along. Use about four fingers to get consistent spacing between each wrap around the tree trunk or limb. Aiming for uniform spacing will make the finished project look its best. With lights wrapped around a spool, a piece of cardboard, or in a ball, slowly unwind as you wrap the strand up a limb or branch. Before wrapping the lights up a branch, determine if you have several extra feet. If so, leave the equivalent of two-hands (eight fingers) width, so that when you double back down, the spacing will be even and look consistent with the other branches. If you're handy outside the house or hang lights on your roofline or other areas of your home or yard, then you probably own or have borrowed an extension ladder. Before leaning the extension ladder against a tree, make sure it's at a proper angle and its base ​is secure and not tippy. Odd shapes of branches and limbs become magical in the evening when illuminated with twinkling lights. Dazzle your back yard all year long (in some climates) or the front yard during the winter holidays.